For fast and remarkably easy escrow services, Bethesda, MD buyers and sellers trust Eastern Title and Settlement. We know escrow gets a bad rap in the real estate world, but that doesn’t have to be your experience. Our professionals know every trick in the book to facilitate smoother, simpler escrow processes for parties involved in a realty transaction. Whether your goal is to close on your dream home or protect yourself as a seller, we can help. Talk with our escrow experts today for advice, and get the ball rolling on closing. Making your property tax and insurance payments. When you work with an escrow service provider, it is the company’s duty to pay all jurisdictions to which you owe taxes. Missing a payment becomes the company’s responsibility, not yours. This can help you avoid penalties and lapses in coverage. Getting help with homeowner budgeting. Escrow services are ideal for people who aren’t great at saving money. An escrow account can make sure you set aside enough for property taxes and insurance policies, instead of spending it elsewhere. Escrow guarantees you can make your required payments when the time comes. Lowering loan interest rates (and potentially saving thousands). Many lenders will offer special, discounted rates for applicants who keep their funds in an escrow account. Lower loan interest rates can develop into substantial money savings over time. Some lenders don’t make escrow a choice; instead, it’s a requirement. Don’t believe everything you hear about the escrow process. Escrow doesn’t have to be lengthy, difficult, or expensive. In fact, you could benefit considerably from escrow during a real estate transaction with the right third-party provider. From meeting lender requirements to paying your bills in a timely manner, escrow could be the solution to many different problems while buying or selling a property. Learn more about escrow and other services we offer at Eastern Title and Settlement. Why Pick Us for Escrow Services in Bethesda, MD? If you know you’d benefit from entering into escrow, the next step is choosing your escrow service provider. Eastern Title and Settlement has more than 20 years combined experience among its staff members. We specialize in handling even the most complicated closings. We achieve success with every client we take on by going the extra mile. Don’t take our word for it – view our case studies to see our commitment at work. We work hard morning and night to improve the way we serve our clients and community. When it comes to finding honest, reliable, and affordable escrow services, Bethesda, MD residents don’t look further than Eastern Title and Settlement. You can trust us completely with your most complex real estate needs and requirements. Whether you’re dealing with your first or 10th real estate transaction, we can help. From education on the home buying process to complex real estate transaction assistance, our staff handles it all. Eastern Title and Settlement knows real estate. Enjoy 100% confidence in the integrity of your purchase or sale when you partner with us as your escrow provider. Our team has the documents, resources, and first-hand experience to make escrow easier than you could have imagined. Get to know us! We have in-house attorneys available to answer your most complicated questions at any time, as well as your own personal customer service representative. We make escrow fast, convenient, and rewarding. 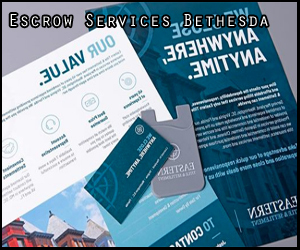 To learn more about professional escrow services, Bethesda, MD locals can contact us at (240) 403-1285.